Timothy Mouse is both streetwise and soft-hearted in the Disney classic Dumbo. 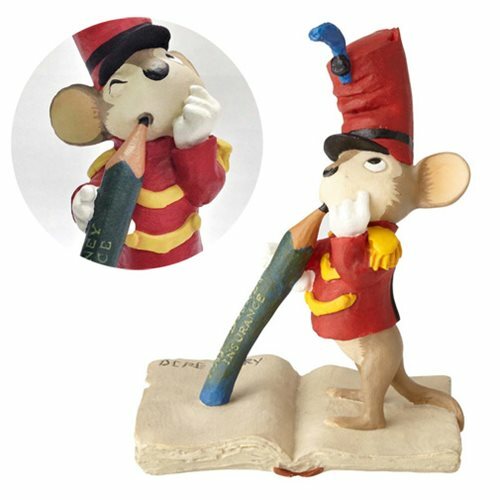 His pose here is from an abandoned segment entitled "A Mouse's Diary," and the skillfully crafted hand-painted Walt Disney Archives Collection Dumbo Timothy Mouse Maquette Statue originates from a late 1930's maquette in the company collection. Made of stone resin, with vintage coloration achieved by hand matching paint swatches from the Disney paint palette to the originals, the fabulous 5 3/4-inch tall figurine is a hand-numbered limited edition of 3,500 pieces that comes with a certificate of verification and a story card. Ages 14 and up.